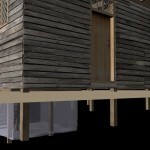 In 2014, the CDHE and Dr. Anne Sarah Rubin collaborated with the Imaging Research Center and Historic London Town and Gardens to build an accurate 3D visualization of the Rumney/West tavern as it would have looked in 1751. Today, visitors to the colonial recreation in Edgewater, Maryland see only an empty field where one of the tobacco port’s social and economic centers would have been. In 1720, London Town, Maryland was a thriving colonial tobacco port, one link in the commercial chain that connected Charleston, South Carolina, and Boston, Massachusetts. Its 100 acres were carefully platted out into single acre lots, ranging along streets like Scotts, Mackelfish, and Fish; a ferry crossed the South River multiple times a day. The tobacco trade required a wide variety of tradesmen and laborers, both free and enslaved, and at least 300 people filled the town. In the 1720s London Town rivaled nearby Annapolis in terms of economic energy; indeed London Town had briefly served as the colonial capital in the late seventeenth century. The building that became Stephen West’s tavern was first constructed in the early 1700s by Edward Rumney, Sr. on London Town’s lot 87. In 1709 Rumney received an ordinary (tavern) license from the Anne Arundel County Court, and within a few years had also begun to operate a ferry across the South River. By around 1720, however, he sold the property to Stephen West, a young ambitious immigrant, who would run the tavern until his death in 1752. West’s tavern appears to have been an upscale establishment. 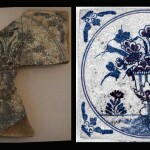 Archaeological excavations of the building’s cellar, which was used as a trash pit during the West years, unearthed a variety of artifacts, including a porcelain coffee cup, several pieces of delftware, including at least one decorated with an unusual mermaid motif, dozens of bottles, and eighteen flint-glass drinking vessels. Taverns, also known as inns or ordinaries, served a variety of functions in the colonial Chesapeake. Of course men drank and socialized there, consuming ale, cider, and distilled spirits like rum in prodigious quantities. Men ventured to local taverns for political meetings to read the newspaper (or have it read to them). Circuit courts and grand juries met within them. Travelers spent the night there, hoping for good food and no bedbugs. Taverns were thus economic and political spaces. They could be sites of social mixing, but not always in the ways that we might assume. For example, elite women would rarely be found in the public spaces of a tavern, as to do so would be to put their reputations at risk. A town with many taverns, like London Town, would have different establishments catering to clienteles of various classes. Lower class sailors, for example, would probably not have been welcome in a more genteel establishment like West’s tavern. 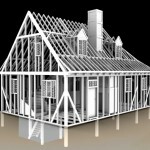 The visualization project drew on 20 years of archaeological research by Historic London Town and Gardens and the Anne Arundel County Lost Towns Project. In 2014, London Town worked with Willie Graham, the curator of Architecture at the Colonial Williamsburg Foundation, to prepare a set of detailed architectural drawings. The drawings, based on the available archaeological evidence, show the size and framing of the building. The drawings also include descriptions of the historical building materials, such the types of boards and fastenings down to the number of tree rings. The IRC used the Graham drawings to construct a meticulous model of the tavern. 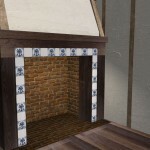 Textures (historical woods, plaster, and tiles) were collected from London Town and then mapped onto the 3D geometry to re-create the tavern’s materials and surfaces. In the future, we hope to build a more fully immersive experience that will allow visitors to walk through the space and listen in on the eighteenth century world of the tavern. To that end, the IRC created a trailer or project sample that shows the visualization process, from the modeling to the texturing to the fully rendered visualization of the inside and outside of the West Tavern.